In an apparent sign of a rapprochement, arch-rivals North Korea and US met for the first time on the second day of the six-party talks here today on the key issue of lifting of crippling sanctions on the Stalinist state but the parleys remained inconclusive. Prime Minister Manmohan Singh today arrived here by a special plane which landed at the Rajasansi airport at 10.25 pm. 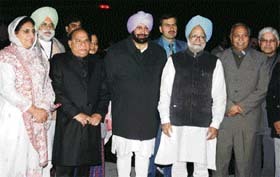 Dr Manmohan Singh, Prime Minister, being welcomed by the Punjab Chief Minister, Capt Amarinder Singh, and his Cabinet colleagues in Amritsar on Tuesday night. On September 28, Punjab Chief Minister Amarinder Singh had declared that "not even a single kanal" of land would be acquired for special economic zones. Three Lashkar-e-Toiba (LeT) militants were arrested from Red Fort area here early today. 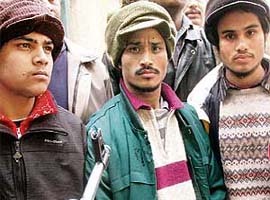 The three militants — Kalam Khurshid Kuri, alias Hussain (23), Abdul Rehmat, alias Mahammad Hussain (24), and Mohammad Akbar Hussain, alias Habib (21) — all from the North-Eastern part of India, were apprehended by the special cell of the Delhi police, police sources said. Two kg of RDX, two detonators and one hand grenade were recovered from them. To make the judiciary more accountable by arming citizens with the right to file a complaint against Supreme Court or high court judges for their misbehaviour and incapacity to perform their duty, the government today introduced the Judges Inquiry Bill in the Lok Sabha, providing for the setting up of a national judicial council to probe such complaints. A member of the Rajya Sabha from Haryana, Mr Tarlochan Singh, said the issue of the expansion of Chandigarh airport was raised today by him at a meeting of the Parliament Committee on Civil Aviation. The Special Court Judge, Ropar, Mr G.S. Saran, today issued a notice to the former Chief Minister, Mr Parkash Singh Badal, his son, SAD general secretary Sukhbir Badal, and others to appear before the court on December 23 in a corruption case registered against them by the Punjab Vigilance Bureau. Punjab's dream for an international airport in Ludhiana (Halwara) would take much longer to realise than the state was expecting as the proposal is stuck with the Ministry of Defence particularly with the Indian Air Force.